Israel's war of repression on BDS is being met with determined organising that exposes anti-BDS bills as undemocratic. An anti-boycott amendment was withdrawn in the Massachusetts senate on 14 July following a campaign by Palestine solidarity groups. The amendment, which was tacked onto an unrelated economic bill, would have blacklisted individuals and businesses that engage with the Palestinian-led boycott of Israel. Amendment 133 was withdrawn within just a few hours of being proposed by Massachusetts State Senator Cynthia Creem. These bills are part of a growing wave of legislation promoted by state and federal lawmakers – and encouraged by Israel lobby groups and the Israeli government – to suppress activism related to the boycott, divestment and sanctions (BDS) campaign. Leading civil liberties groups and legal organizations have condemned such legislation as violating constitutionally protected rights of free speech and freedom of association. Organizers in Massachusetts say that in order to successfully counter the imminent anti-boycott legislation there, they knew they had to engage directly with lawmakers over a sustained period. “What happened in Massachusetts shows the importance of putting a broad coalition of groups together to challenge what we know is coming down the pike,” said Nancy Murray of the Boston Alliance for Water Justice in Palestine. In December 2015, a group of Massachusetts senators traveled to Israel on an all-expense-paid junket organized by the Jewish Community Relations Council (JCRC). The JCRC has an Israel lobby wing and supports anti-BDS legislation across the US. A petition organized by the Boston Alliance for Water Justice in Palestine gathered 1,200 signatures, urging the senators to cancel their trip. Activists filed an ethics complaint alleging that the senators would be violating state conflict of interest laws in accepting the junket, but it was rejected. Murray said that upon the senators’ return, members of Palestine activism groups scheduled visits with as many of the lawmakers or their staff as they could. The JCRC then announced last March that it was working with lawmakers to draft an anti-BDS bill. Human rights activists reacted quickly, forming the Massachusetts Freedom to Boycott Coalition. In just one week, they “got 61 organizations from across the state to sign an open letter to the state legislature condemning such legislation,” Murray said. Then, last week, while activists met with State Senator Jaime Eldridge about General Electric – another focus of BDS campaigners, which is receiving $270 million in public funds to move its headquarters to Boston – Eldridge had said that an anti-BDS amendment was going to be heard that day during the senate session, according to Eli Gerzon of JVP-Boston. 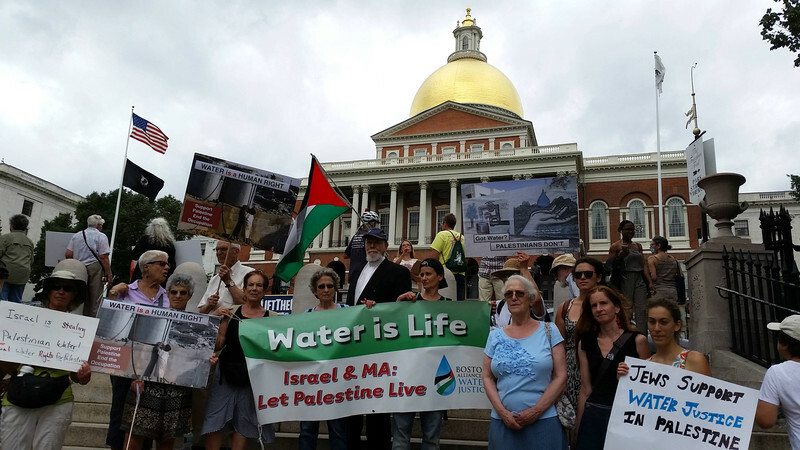 Dozens of members of the Massachusetts Freedom to Boycott Coalition were already at the state house in Boston that day, protesting against Israel’s policy of cutting off water access to Palestinian communities. As soon as they got word that the anti-BDS amendment was going to be considered, the activists, who had been delivering letters to lawmakers about Israel’s water rights violations, urged their representatives – including Senator Creem – to oppose the amendment. Coalition members also “mobilized their supporters to contact their senators by phone, email, and social media to urge them to oppose the amendment and succeeded in shutting it down,” the group Massachusetts Peace Action said in a press release. Still, Murray noted that activists must “be prepared and be present” as Israel lobby groups work closely with lawmakers to pass more anti-BDS bills across the country. “We must let state legislators know we are organized and determined not to let them pursue business as usual as far as knee-jerk support for Israel is concerned,” she said. Meanwhile, local activists are using the momentum of this victory to expand their boycott campaigns. Ibraheem Samirah of the coalition member group Mass Against HP, which is urging the state to end its contracts with Hewlett-Packard over the company’s profiteering from Israel’s violations of Palestinian rights, said that the victory over the anti-BDS bill means that “there is more room” for his group to engage with local and state legislators than previously thought. “We now know more clearly where our routes [for political pressure] are,” he said.